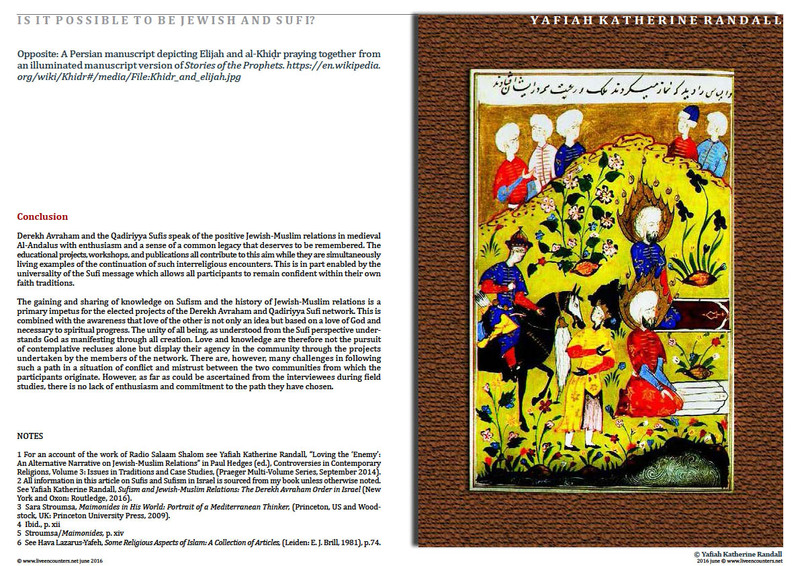 Live Encounters | Dr Yafiah Katherine Randall – Is it possible to be Jewish and Sufi? 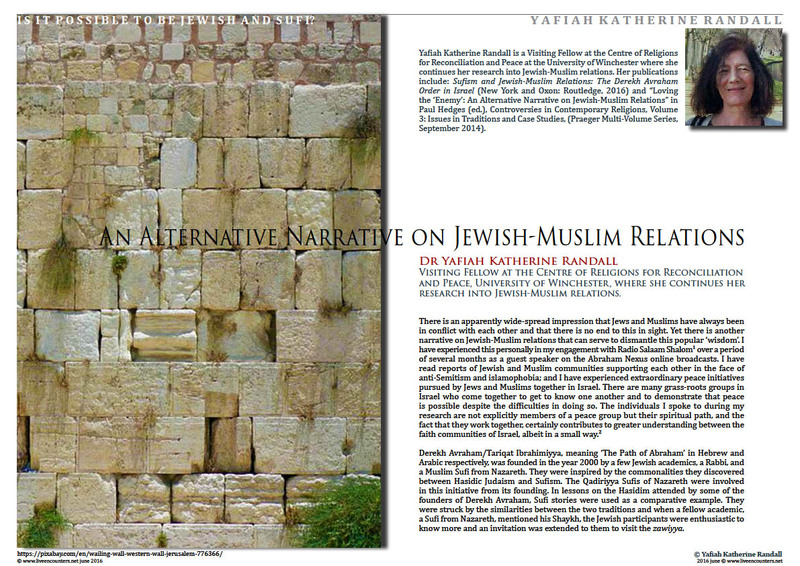 An Alternative Narrative on Jewish-Muslim Relations – Dr Yafiah Katherine Randall Visiting Fellow at the Centre of Religions for Reconciliation and Peace, University of Winchester, where she continues her research into Jewish-Muslim relations. Following the completion of her BA in Arab Studies, Yafiah Katherine Randall spent some time living in Andalucia, Spain pursuing independent study of Al-Andalus and the philosopher-mystic, Muhyiddin Ibn ‘Arabi (1165-1240). The inspiration and enthusiasm she felt for the history of convivencia in medieval Al-Andalus (Islamic Spain), and her ongoing interest in dialogue between the Abrahamic faiths, were pivotal in her decision to pursue postgraduate study. She completed an MA in Contemporary Religions and Spiritualities at Bath Spa University, UK and it was during that time that she met the team at Radio Salaam Shalom in Bristol and appeared as a guest speaker in five broadcasts of Abraham Nexus. She enjoyed the group spirit of community between the Jews and Muslims working at the radio station and the openness and curiosity they all had about each other’s faiths and their experiences as minorities in British society. This experience contributed to her enthusiasm for the history of Jewish-Muslim relations and the situation in Israel and Palestine today which then became the topic for her doctoral thesis. When she discovered that there are Jews and Muslims engaging in Sufi practice together in Israel then she knew this was the topic she wanted to research and to investigate its potential contribution to grass roots reconciliation work. 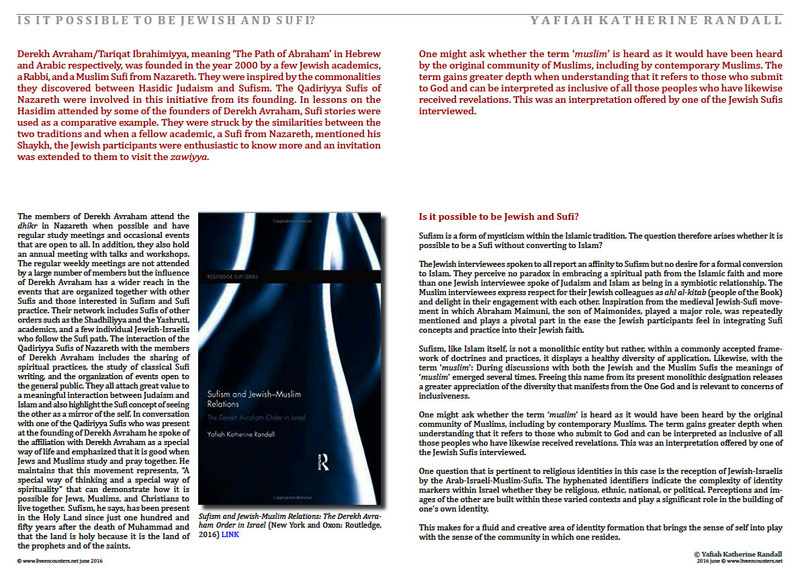 Sufism and Jewish-Muslim Relations: The Derekh Avraham Order in Israel (New York and Oxon: Routledge, 2016). “Loving the ‘Enemy’: An Alternative Narrative on Jewish-Muslim Relations” in Paul Hedges (ed. ), Controversies in Contemporary Religions, Volume 3: Issues in Traditions and Case Studies, (Praeger Multi-Volume Series, September 2014). An inspiring and hope filled article in these times where separation and division are the news of the day. Surely the work and prayer of these people in the midst of great difficulties benefits many and witnesses to the unity of all beings. Thank you.